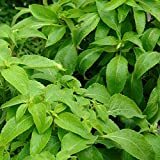 Ocimum gratissimum growing shrub‎ type of basil genus Ocimum also known as Clove basil or African basil, Ocimum gratissimum perennial evergreen or annual plant, grow in tropic climate and growing in hardiness zone: 12+ (perennial), 5-12 (as annual). Leaves color light green big soft with ovate-cordate shape with serrated edge. Is it necessary use vegetative reproduction in Ocimum gratissimum? What is the size of a Ocimum gratissimum? How to make Vegetative Reproduction in Ocimum gratissimum? What is the treatment for vegetative reproduction in Ocimum gratissimum?